Jordan Brand will surely make a lot of noise once again this June 2011 with re-release of one of the most famous model and arguably its most impressive colourway. 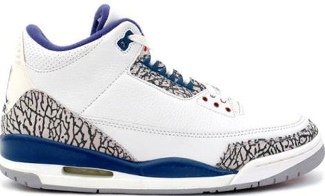 The White/True Blue edition of the Air Jordan 3 Retro, which has created lots of buzz for the past few weeks and even months, will be released today and it is expected to be the hottest item on the market starting today. The much-anticipated Air Jordan 3 Retro still features the eye-catching design and top-class performance-based quality, making it a must buy this month. So what are you waiting for? Grab one immediately and don’t dare miss it!